Conventional exercise has got nothing on water walking in the pool or the beach when it comes to getting a great aerobic workout to get in shape the smart way. Water exercise is a precursor to conventional exercise. Before there were weight machines and all the commodities you are used to using to get in shape there was water walking. Trekking through pools of water high than your waist is a lost but not forgotten fitness gem that you would be silly not at to your workout routine. Is water walking good exercise for getting in shape in the pool? Don't make not being able to swim an excuse not to exercise in water. 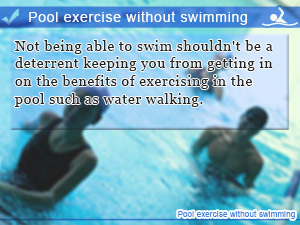 With water walking you don't have to be a good swimmer to get the Best Pool Exercise without even swimming. For people not confident in their sea legs, water walking is the next best challenge in fitness to Get In Shape you shouldn't pass up on if you really want it. Exercise in water compared to that of land burns more fat, helps you build stronger muscles, and is very effective in burning off calories, all the things you need in your diet and exercise program to get in shape faster than the maybes of conventional exercise making your wait for results to show making surface in your slim figure. In this daily Slism, we are going to get wet with water walking, a great way to get in shape in the pool even though you don't know how to swim, going into detail how to get started while discussing the many benefits in store from taking up in water exercise, finishing with some advice to avoid common pitfalls most people take. Water walking as you may have figured out right now has nothing to do with walking on water. Although that sounds like it would be a great exercise to test your balance, what we are going to talk about is how to exercise in the pool without having to know how to swim by simply walking in water to get in shape with minimum risk. Just the fact that in-water exercise reduces the risk of injuring yourself while working out makes it possible for more and more people to get involve in active exercise than never before participating in fitness routines such as water aerobics and water walking being introduce on this page but that's not all. 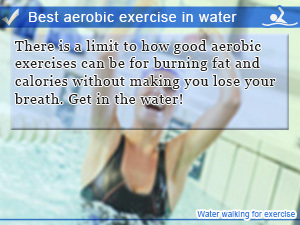 Exercising in water doing exercise such as water walking is a totally different workout experience than land exercise. For starters, resistance to water pressure surrounding the outer walls of your skin make it harder to keep your balance which is the contemporary of weight on land. Getting used to it requires time but in the end is worth it. Although to what it would seem just by walking facing forward you are also going to move forward. That would be the case if you didn't have to worry about how you place your feet. Lift your footoff the surface in which you are standing at your heel landing softly on the bottom surface of the pool fully lowing your feet. In addition you are going to want to make sure your back is straight adjusting your posture avoiding leaning your upper back too forward in a stoop throughout the course of the exercise for best results. Remember this is supposed to be aerobic exercise so don't push yourself to the point where you lose your breath while water walking enough to hum a song through your nose. This is an important key point to get in the fat burning zone. Just by adding a little extra to the foundation steps of water walking you can greatly improve upon the results you get out of your workout. Most importantly, focusing on the areas you wish to train is how you get it down right. Here are some simply ways you can alter the way you walk to target different parts of your body. Once you got all the steps down to a science bringing your forward in fitness take a few steps back to reflex on your workout plan. Are you doing everything you can to ensure success in your diet? If you haven't started walking backwards in the pool, then that's a no. Walking back words helps train areas left over after regular water walking. Walking in water makes a great aerobic workout that helps put your body in the fat burning zone fast helping your burn fat like a fat burning machine. In addition, water buoyancy reduces the burden that the exercises have on your body making it more enjoyable while you burn more calories and fat than before. With fewer burdens on your body by taking up water walking you can enjoy yourself exercising getting the same results as out of water exercise. Just because in water exercise such as water walking is easy on your joint doesn't mean that you don't get a good workout. In fact it may be your best bet to getting stronger muscles. One area that defeats the purpose set out by taking up water walking as exercise is slacking on good form. Not only failing to practice good form means less calories, it doesn't help you position your body to build muscle mass throughout your body not to mention what it takes away from the balance exercise you should be getting. 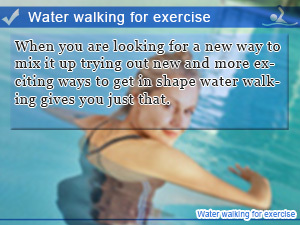 When you are looking for a new way to mix it up trying out new and more exciting ways to get in shape water walking gives you just that. Not being able to swim shouldn't be a deterrent keeping you from getting in on the benefits of exercising in the pool such as water walking. There is a limit to how good aerobic exercises can be for burning fat and calories without making you lose your breath. Get in the water!